This week's edition features Burlesque and Beaches Jazz festivals; outdoor screenings, cabaret, and Shakespeare; a pirate ship show and party, and a memorial for the creator of the zombie film genre. Roxi D’Lite appears at the week’s Toronto Burlesque Festival. Photo by Jo Gorsky. The Toronto Burlesque Festival features dozens of performers, both local (Pastel Supernova, Coco Framboise, Kage Wolfe) and international (Las Vegas’s Roxi D’Lite, Munich’s Harden Reddy, Minneapolis’s Redbone), at shows at Revival and the Mod Club. In addition to the nighttime showcases, there are also workshops this weekend taught by multiple performers in case you’ve ever been curious about how to twirl those tassels. To July 23, various venues & times, $20-$500. To September 3, High Park Ampitheatre (1873 Bloor Street West), Tuesdays/Thursdays/Saturdays, 8 p.m., PWYC. The annual Beaches Jazz Fest moves all over the east end this month, with programming this weekend and next at Woodbine Park, and a street version on July 27 along Queen Street East. Music acts on the bill for this weekend include a tribute to Prince tonight and The Band on Saturday, plus individual acts like Jane’s Party, Maya Killtron, and Lorraine Klaasen. To July 30, various venues and times, FREE. Despite their ample and eccentric catalog, many Radiohead fans consider OK Computer to be the band’s best recorded album, and tribute act Idioteque is playing it cover to cover tonight, with opener Omhouse. Horseshoe Tavern (370 Queen Street West), 9 p.m., $10. The cast of Flooded set sail for six on-the-water performances this week. Photo by Ara Glenn-Johanson. There are several street festivals that drivers will have to avoid this weekend and everyone downtown may want to head to. The biggest is BIG on Bloor, which will shut down Bloorcourt Village from Dufferin Street to the Railpath, featuring multiple live music stages and plenty of local food vendors. To July 23, Bloor Street Between Dufferin and Roncesvalles, Saturday 1 p.m. to 11 p.m., Sunday noon-6 p.m., FREE. Condensed in size, but taking place along one of Toronto’s trendiest strips, OssFest is taking place along Ossington from Dundas down to Queen, and will feature an urban bicycle race, two music stage, kids programming, and more. Ossington between Queen Street and Dundas Street West, 2 p.m.-11 p.m., FREE. You still can’t get to Centre Island, so how about boarding a pirate ship and sailing close to it, while being entertained? 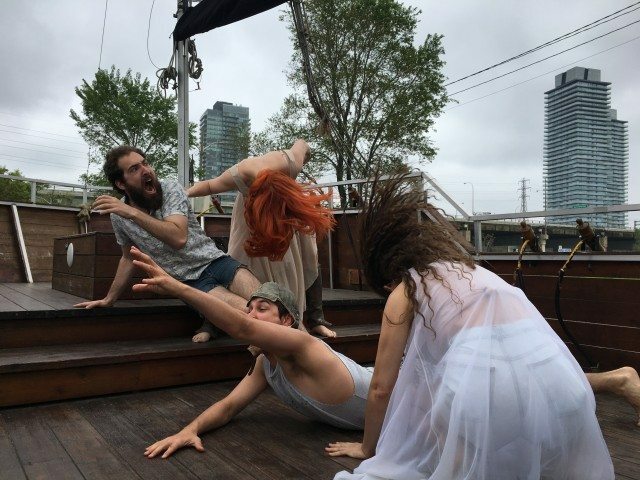 Flooded is a new play by the NORTH AMERICA company, using clown and physical theatre techniques for a wordless adventure on the high seas (of Toronto Harbour). Just 30 passenger-patrons a night will get to board and sail with the company for an hour. To 25 July, The Pirate Life Boat (333 Lake Shore Boulevard), sail time 6:30 p.m., $25. Left to right, Karen Knox, Gwenlyn Cumyn, and Cynthia Hicks in a still from Barbelle. 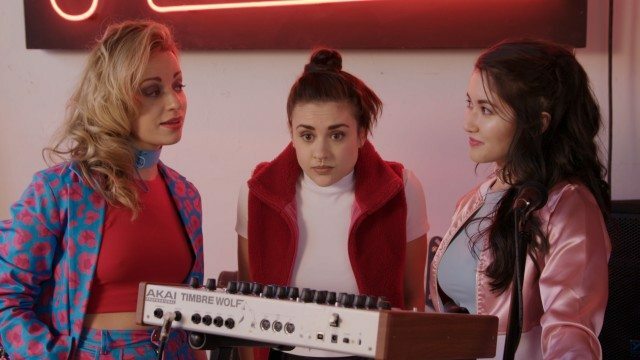 The creators of the new, locally-shot webseries Barbelle describe it as a “a lesbian Spice World in Toronto, [and] a queer love letter to the Canadian music scene.” It’s set to premiere on Bell Fibe in August, with the official trailer slated to drop this Saturday, but attendees of the Barbelle premiere screening will get to see it all first—plus, there’ll be a rainbow carpet, cast and crew in attendance, and an afterparty at Lucky Shrike Bar. Royale Cinema (608 College Street), rainbow carpet at 1:30 p.m., screening at 2 p.m., $10. Sharron Matthews. Photo by Mike Bickerton. Zombie film legend George Romero had made Toronto his home in his twilight years and had become a beloved senior figure in the film and horror film community here, often appearing at retrospectives and events, so his recent passing has hit many hard. Accordingly, there’s a George Romero Memorial and public celebration of life happening this Monday, with the undead expected to show up in shambling droves. Mount Pleasant Cemetery (375 Mount Pleasant Road), 2 p.m.-8 p.m., FREE. The Shakespeare in High Park company has Mondays off, so what’s to be done with the dark space that night? The Musical Stage Company has slotted in Sharron Matthew’s Girl Crush for a one-night-only performance. The internationally renowned cabaret performer, still probably best known to film fans for her role in Mean Girls, will be singing a selection of pop songs from the 80s and 90s woven into her newest act. High Park Amphitheatre (1873 Bloor Street West), 8 p.m., $20-$30. 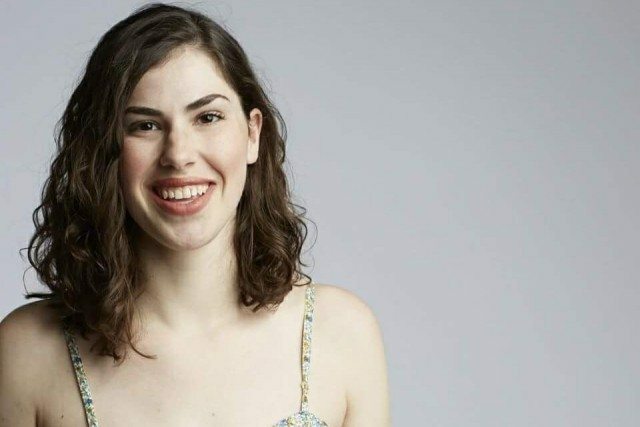 Cara Connors appears on Queen and Present Danger’s bill tonight. Detail of a photo by Kabir Ali. There are several hot concerts tonight—Spoon plays Massey Hall, Kendrick Lamar plays the Air Canada Centre—but given the gorgeous weather, wouldn’t you rather see a show outside? And then maybe watch fireworks? You can do both at tonight’s instalment of the Open Roof Festival: local act LOLAA will play, followed by the film Brimstone and Glory, a documentary about The National Pyrotechnic Festival in Tultepec, Mexico. 99 Sudbury, doors at 7 p.m., music at 8 p.m., screening at 9 p.m., $15. Comic Chantel Marostica, recently profiled in our Mirthful Mx. In The Six series, hosts Queer and Present Danger, a showcase of LGBTQ comics both local and further, featuring acts like Elvira Kurt, Cara Connors, and Bee Bertrand. Marostica has teased that they’ll be unveiling some big news at the end of this month’s edition, which is donating a portion of every ticket sold to the 519 Centre. The Rivoli (332 Queen Street West), 9 p.m., $15 in advance, $20 at the door. Urban Planner is your weekly curated guide to what’s on in Toronto—things that are local, affordable, and exceptional.